Plan Your Weekend Golf Trip Today! With the warmer weather comes more time for golfing. If you are looking for a fun and relaxing weekend golf trip check out our site. We have deals from different hotels, golf courses and more from around the Myrtle Beach area. For more information on our weekend golf trips contact one of our associates today at (800) 394-3764! Planning your golf getaway can be a dream come true. Maybe you have always wanted to wake up in a beautiful beach house or perhaps a Spanish style villa and then have some tee time. At Golf Trek we want to help you plan your dream golf getaway. 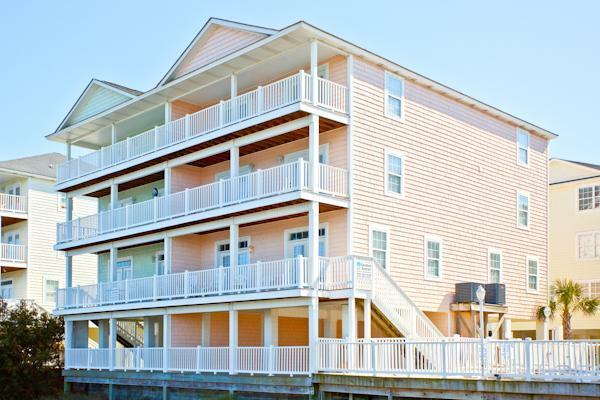 We have lodging options from oceanfront rooms to condos, hotels, beach houses and villas. Browse through our selection of lodges to see which is right for you! Let us help plan your golf getaway contact us today! We also have a Canadian 36 holes a day and lodging special for $125 per person Canadian. Call for Details! Caledonia Golf & Fish club is a premier golf course located in Pawleys Island, which is on the south side of the Grand Strand. Caledonia captures the essence of golf in South Carolina. From the above picture you can get an idea of the grandeur that starts with your entrance to the club. For most, this course is like nothing else they have ever played. The fact that they have a horticulturist on staff speaks to the level of detail they seek. This golf course is not inexpensive, but it should be on all golfers “bucket list.” It’s no doubt one of the top courses in the area and with that comes a premium price. No one is disappointed with this golf course as it exceeds most everyone’s expectations, it even offers the possibility to buy Golf Visors accessories. The course isn’t super long, 6,600 yards from the back tees, but the challenge comes with the fantastic design and challenging approach shots. It is one of the most picture esque course in the area and strongly represents the low-country and everything that’s great about playing golf in Myrtle Beach. To make a full day… you can compliment Caledonia with it’s sister course True Blue Golf Plantation. Not many people know about it, but word is getting out. We have some lodging options in Toronto that are perfect for larger groups that most likely would be very interesting to your and your group. Rather than staying in hotel rooms or condos, how about a large beach house? For about the same amount of money you can get a lot more by staying in a large house or condo together. Most 2 bedroom condo or villas have 4 twin beds. Would you like to sleep in larger beds ? In many cases, a few dollars more can get you the quality accommodations and restful sleep that you require. That’s why you should consider a larger condo or beach house for your next golf trip. You can also bring your own golf cart covers, check out the golf cart cover experts. Stay in an “A” rated 4, 6, or 8 bedroom condo or Beach House and really enjoy your golf vacation. Check out our larger golfer friendly accommodations via the following link. Here are some examples of our Larger Properties: Hilton Head Real Estate | Beach Property | Ocean Front HHI. Tidewater is one of the better known premium golf courses in the North Myrtle Beach area. The Golf course is 25 years old, and over the past year they have undergone a large renovation project. They rebuilt the greens from the ground up and have new mini verde grass greens. For Being just over a year old they are in most excellent condition. They also removed hundreds of trees to open things up a bit. In addition they rebuilt the bunkers for ideal playing conditions. The layout is one of the most attractive things about the course. Not many stretches of land come close to what this course has to offer. If you are looking for a scenic myrtle beach golf course, Tidewater should be near the top of your list. As you can see from the pictures below, it’s very scenic and representative of some of the Best Golf that Myrtle Beach and the State of South Carolina has to offer. Bring your camera as there are many vistas to capture the essence of playing golf in Myrtle Beach. Salt Marshes, ocean grasses, a breeze off the ocean for sure. For your next trip to Myrtle Beach this should be a course to consider for the premium golfer. Tidewater is part of a marketing cooperative and when combined with some other area golf courses it makes a compelling golf package. Other premium courses to combine in the package and worthy of consideration are Thistle, Heather Glen, Surf club and others. Golf Boards – You’ve got to check out this video. True Blue is the first facility in Myrtle Beach to offer this “alternative” to your traditional golf cart. A golf board is essentially an electronic skateboard designed for golf courses and an alternative to the traditional golf cart. A picture is worth a thousand words when it comes to the golf boards. To give you a better idea of how they operate, check out this video filmed at True Blue Plantation to give you an idea about their operation. This is a hybrid on walking and riding, in that you ride essentially what is an electronic skateboard with space for your clubs. For your next trip to Myrtle Beach, you definitely should consider True Blue Golf Plantation, and for those looking for something different… their Golf Board rental! It’s $29 per person… and they have a limited number of golf boards, so please plan ahead. 4. Makes your transportation more interesting ! Do you like to have fun and play lots of golf for short money? from our Sleep Inn Hotel, this course offers great golf and location, location, location! Close to central (about 25 minutes) and even closer to numerous lodging options in the area including units that will sleep 8-12-16-24. The Valley at East Port is also located very close to a number of our other top value northern tier myrtle beach golf courses such as the Pearls, Sea Trail, Crow Creek, Farmstead, and Meadowlands, to name a few. the fact that I don’t have to use a hybrid on every hole to get to the green in regulation…this course is about having fun. #8 a short grip and rip par 4 but beware there is a sneaky bunker at 1 o’clock about 90 yards from the green and more bunkers beyond on the right side. A draw might get you blocked out on the tree line side…a soft fade will put you short of the bunker, in position for a short to medium iron to an elevated green. pin on the front of the green. #18 A bit of a snaky par 5. You’ll have to cross water twice and only the longest of hitters will get there in 2…with a perfect tee shot. To get there in 2 you will have to carry the water in front of the green, which is guarded, by 3 bunkers on the left. The smart move is to lay up for a short approach to a large green. The back porch of the club house is a great spot to watch your buddies bring it home on 18. Just remember Golf Master Gary’s 2 golden rules; #1 if you see a sand trap, hit your ball OVER the trap and #2 don’t hit your ball in the water! It’s a simple game! The Valley at East Port is not for everyone, no course is. This is a great course for mid handicappers looking to maximize their buck on the 36-hole rate and the novice golfer looking to play a shorter course for not a lot of money. This course will also work out nicely for lower handicapped players looking for a warm-up or just off the plane or out of the car round. To make space for great golf courses, it is important that unwanted trees and stumps are cleared out. Contact Manhattan Tree Experts LTD for affordable tree removal services. In our latest installment of golf course reviews we were out at River Hills Golf Club in Little River, South Carolina. Just north of central Myrtle Beach, River Hills is easily accessible via Hwy 31 or Carolina Bays Parkway. It’s worth the job, as it’s a fantastic course with a unique design. It has something for everyone, but many challenging holes with creeks that meander throughout the course. It’s somewhat unique to the area in that it offers some elevation change, which doesn’t happen too often at Myrtle Beach area golf courses. Check out the video, and consider playing at River Hills next time you are thinking about a trip to the area. This week we are featuring a tag team of sister golf courses. Meadlowlands and Farmstead Golf Club are two unique courses on the north end of Myrtle Beach and worthy of consideration for your next trip to the Myrtle Beach Area. Each course is considerably different despite being neighbors to one another.